After you have finally picked out your favorite car, you now have to make a few more decisions. You need to choose your most desired features. 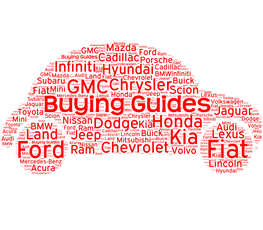 Here are a few tips to buy the car that you want. Most of today’s automakers provide a vehicle configurator on their website. This is a tool that allows car shoppers to essentially build their vehicle. From special trim packages to high-tech upgrades, you will be able to make a variety of different selections. The vehicle’s total cost will either increase or decrease based on your choices. Your local dealer may not have the exact car that you want. Take a glance at the dealer’s inventory by viewing their website. Although they might not have the exact car that you want, the dealer can put you on a waiting list. If you are willing to travel, you may also find the vehicle at another dealership. Some vehicles are extremely popular. This means that they are unlikely to remain on the lot for a long time. If you truly want the vehicle, you may have to make some compromises. For example, settle for a red paint color instead of blue. Furthermore, limited-production vehicles make it even harder to be extra picky. You definitely have the ability to make a custom order. However, remember that the vehicle can take several weeks to arrive. The lengthy waiting period can present a problem for some people. However, this is a good option for the car shoppers who already have a ride. The key is to maintain a great deal of patience. When attempting to purchase a certain vehicle, never lose sight of your budget. Remember, the top trim level can cost several thousands of dollars more. Accessories such as wheels and tires can be upgraded at a later time. Avoid paying extra for a feature that you truly don’t need. Always look at the big picture before wasting any money. Nothing beats being able to actually sit behind the wheel. While pictures provide a great visualization, you still need to tour the vehicle in person. After seeing the base model, you may not notice a big difference from the higher trim levels. This is especially true if the base model comes equipped with the same engine and transmission. At the end of the day, your goal is to make a satisfying decision. You surely don’t want to experience buyer’s remorse. If you have your eyes fixated on a specific car, use these tips to seal the deal. Buying a new car can be a very exciting opportunity. However, you need to do some homework before you even arrive at the dealership. By preparing yourself in advance, the entire process will be a lot smoother. Here are some important car buying dos and don’ts to keep in mind. It is always a good idea to thoroughly research the cars on your list. In some instances, you may find out that a particular vehicle is not a good choice. Some of the key things to research include the vehicle’s gas mileage, horsepower, interior room, reliability, and safety features. You also need to read some reviews on the car’s real-word performance. You never want to make the mistake buying a ride that is too expensive. If the payments are more than 20 percent of your monthly earnings, keep searching for another vehicle. Consider going without certain features. Heated seats and high-tech infotainment systems can cause the total price to rise dramatically. Stick with the base model if needed. Understandably, financial institutions usually look at a person’s credit score. The higher your credit score, the more flexibility you will have at the dealership. Save yourself some stress by researching your credit score in advance. Don’t waste your time by looking at a ride that is well out of your price range. The thought of buying a new car can be very exciting. However, remember to keep your emotions under control. Your excitement could cause you to make a poor decision. Although a beautiful coupe may be appealing, it is a bad choice for a family of five. Always keep a cool head when shopping for a car. Never attempt to use your trade-in as a bargaining tool. You should first finalize the purchase price of the new vehicle. This will give you the best chance of getting a good deal. If the dealership offers you a low amount for your trade-in, sell it yourself. Take a good look at these car-buying tips. By doing the proper research at home, you can walk out of the car dealership with a great deal. View New Car Rebates - Find out what's on sale. 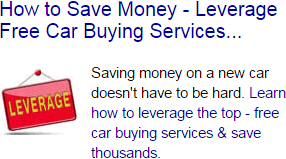 Learn How to Buy New Cars Below Dealer Invoice Prices - Save Thousands on your next new car.